The Cushy Cowl is a bit more challenging than a garter stitch scarf, but not so hard as to scare off beginners. It’s a project that introduces a few essential techniques that will move you beyond noob territory and closer to the realm of hats, socks and mittens! Best of all, the cowl is knit in garter stitch with super bulky yarn, which produces a thick fabric that highlights the sculptural and springy qualities of garter stitch. Super bulky yarn also knits up quick for instant gratification! Win-win! Grab the free knitting pattern at the shop and follow along in the tutorial video! Note: this video is close captioned. Turn it on in the bottom-right corner of the player. In this tutorial video you’ll learn how to cast on with the best, default cast on – the longtail cast on – and how to knit garter stitch in the round. You’ll also learn how to join a new ball of yarn to your work and how to weave in your ends for a neat finish. And then… you’re done! Loop the cushy cowl around your neck and stay toasty against the polar vortex! 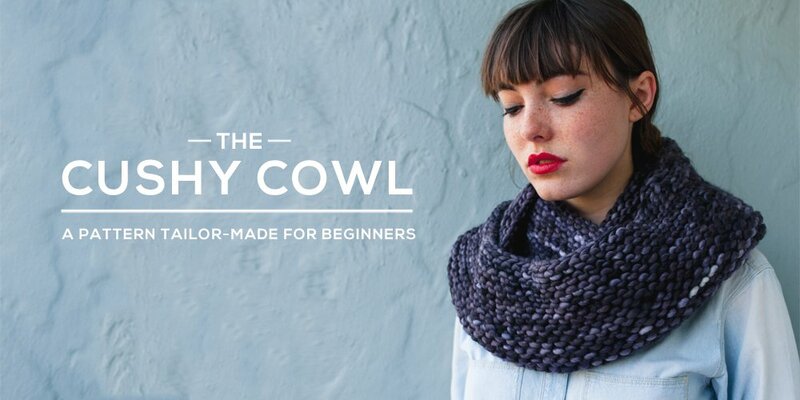 Proud of Your Cushy Cowl? Share a photo on our Facebook page and let us see the glorious work of your hands! Viewing the PDF File: If you’re having trouble viewing the PDF, please check out the technical support page. If you are unable to view the pattern in the browser, try saving the PDF file to your hard drive first and then opening the PDF in a PDF reader like Adobe Reader, which is free, or an app like Preview on a Mac. * Affiliate Disclosure: Please note that some links in the materials list are affiliate links. This means that, at no cost to you, I will earn a small commission if you decide to make a purchase through the links. Please understand that I’ve purchased all of these items on my own. I’ve had success using them, which is why I recommend them. However, only buy what you need! Many knitters have used other materials, and their results are just as lovely. Hi Lavonda! I’m delighted the How to Knit videos have helped you out! And – oh my gosh! – I’m so pleased you mastered the longtail cast on. It’s a bit finicky, right? But it’s so, so useful. Best of luck in getting 3(!) cowls done a day. I think you can do it. Invite some friends over, have some tea, knit those cowls. It’ll be a blast! Thank you SO much for the videos and website! I am sure I found a new hobby! What a good idea! I’ll put that on my docket. Thanks for your suggestion, Johanna! I have been watching and re-watching all your videos and I am starting to get the hang of knitting! Yay. One question: I seem to back myself into a corner with making my knit so tight that I can barely get the needles into the next knit. I can’t tell which part I am making too tight that causes this to happen? Hey Shy! That is awesome! I’m so glad you’re getting the hang of knitting. As for tightness: that’s totally normal. Most beginner knitters are nervous about their stitches slipping off the needle, so they grip the needles and pull the yarn really tight when they’re making their stitches. One solution is switching to big wooden needles. Something like a 6mm and above is a good size. The ones I use in the video are 7mm. Wooden needles are less slippery to hold, and they grip your stitches better than steel or aluminium needles. So if you can, get yourself a pair to practice with. Another solution is to practice knitting with wool yarn. Nothing fancy, just some plain wool you can pick up at a dollar store or at Michaels, preferably heavier, like a heavy worsted or chunky weight. Wool is less slippery. It’s “grippier” for lack of a better world, so combined with a pair of wooden needles, you’ll have a great setup. The last solution is… practice! The reason why you’re pulling your stitches so tight is because you’re nervous they’ll fall off your needle. Totally normal. However, the more you practice knitting, the less nervous you’ll become and the less tightly you’ll grip your needles. You’ll also become more confident in your hands and the way they move around your needle. As the saying goes, practice makes perfect! Okay, this is getting to be an essay! First thing is: get a pair of wooden needles, preferably 6mm and above. Second: get some cheap, heavier-weight wool. Third: practice! I hope this helps, Shy! If it’s a personal project for yourself and you’re using animal fiber like 100% wool, you can use a technique like spit join. Otherwise you can splice the yarn with a yarn needle if it’s not animal fiber. Both techniques literally join both yarns into one. Spit join! Yeah! You’re giving me some good ideas for future tutorial videos. Is there a reason it seems like there is a bit of a seam even though it was knitted in the round? Hey Nathan! Nice observation! When you knit garter stitch in the round, each new row will be higher than the one you just finished, so you’ll see a slight join where your new row meets your last row. That’s the “seam” that you’re seeing. When you begin a new purl round: Take the marker off your needle and with your yarn held in the back, slip the next stitch, purlwise, from your left needle to the right needle. Then put the marker back on your needle and purl the next round (including the stitch you slipped). 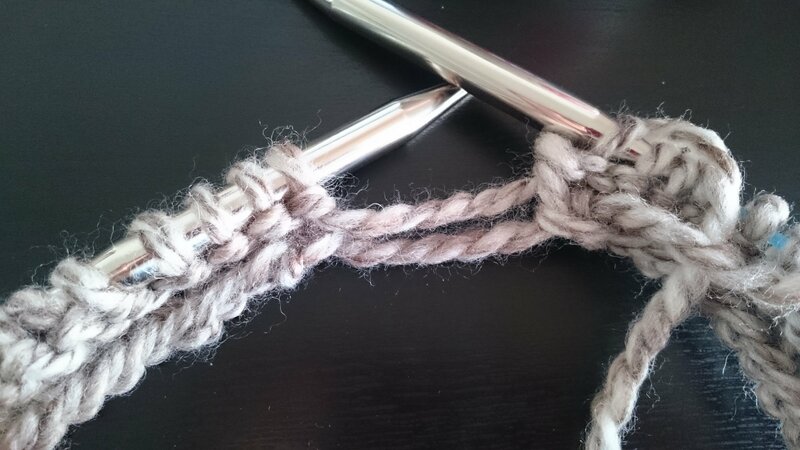 On the knit round: remove your marker and slip the first stitch from left needle to right needle, knitwise. Replace your marker and knit the round (including the stitch you slipped). You can repeat these two rows to get a “seamless” garter stitch. What we’re doing is raising the first stitch of the last row up to the level of the new row so there’s less of a visible “seam.” The thing to remember is this: doing this moves the beginning of your round one stitch to the left, so the beginning of your round is “traveling” across your work. This is a *slightly* advanced technique, which is why I didn’t want to introduce it to the cushy cowl since it’s a beginner project! But you’ve given me an idea to include an add-on video tutorial demonstrating this technique for those who want the extra challenge. When you say “including the stitch you just slipped” you mean as the last stitch in the round you’ve just started, right? You slip the stitch, stitch all the other stitches in the round, and then knit or purl that slipped stitch as the 100th stitch? Hi and thank you for your videos. I have knit a bit in the past, mostly scarves, including many unfinished. Decided to start again, made a few dishcloths last week to practise something new. Then the cushy cowl. I did this slipping first stitch technique. I do still have a seam, it just travels diagonally. And my cast on/cast off/joining is a bit visible too. I will make another to practise. Maybe because I was using 10 needles with bulky instead of super bulky, the stitches are slightly looser. I started to cast on with long-tail, but it seemed like my tail never got any shorter. I got to the 100 stitches and I had so much left I ripped it out to start over. Is there a reason this could be happening? Hey Harrison! If everything else is working out, it might just be that you apportioned too much yarn for the longtail! It happens. The wrapping-around-the-needle way to measure is a good rule of thumb, but it’s not a sure-fire way to get an exact length. Once you get comfortable casting on with the longtail, you might develop a sixth sense for how much yarn to apportion. It’s usually a bit of trail and error, but the wrapping-around-the-needle is a good place to start because it rarely ever gives you too *little* yarn. Hope this helps! I’m in love with your how-to videos and I totally think I can learn to knit. And your cast on is by far the easiest I have seen. Thank you much! Suzanne! That’s awesome! So glad I can help. Best of luck knitting the cushy cowl! And share a picture here if you do knit it up! Yes! For sure you can use a US 15 needle. If you’re using super bulky yarn, you might want to cast on a few more stitches to get a comparable length to the Cushy Cowl. OR if you want to be really exact, you can knit a little garter stitch swatch with your yarn and your US 15 needles and measure out how many stitches make up an inch. Then take that number and multiply by 50. That number is the number of stitches to cast on if you want a 50″ cowl (which is the length of the Cushy Cowl). Thanks so much for a fun and informative video ! I love your cushy cowl but the pdf isn’t working. Please help!!! Really want to download it but all the letters are piled on each other. Hi Ivana, So sorry for the late reply. If the PDF is still not showing properly, shoot me an email at [email protected] and I can email you the PDF or a large jpg of the PDF. 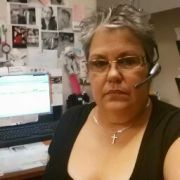 Hi Yolanda, yes, you really do need the circular needle (the big long one with a flexible cord) to make the Cushy Cowl. It’ll be pretty impossible to knit the cowl on regular straight needles. However, you could knit a similar cowl with straight needles by casting on a number of stitches (depending on your yarn weight and the width that you like) and then knitting a long scarf. Once you cast off, you can sew the two ends of your scarf together, thereby making a cowl! I wanted to ask you a question about the suggestion you gave about making a cowl with straight needles and sewing the ends of the scarf together. I’m trying to knit a cowl/circle scarf and only have straight needles as well. 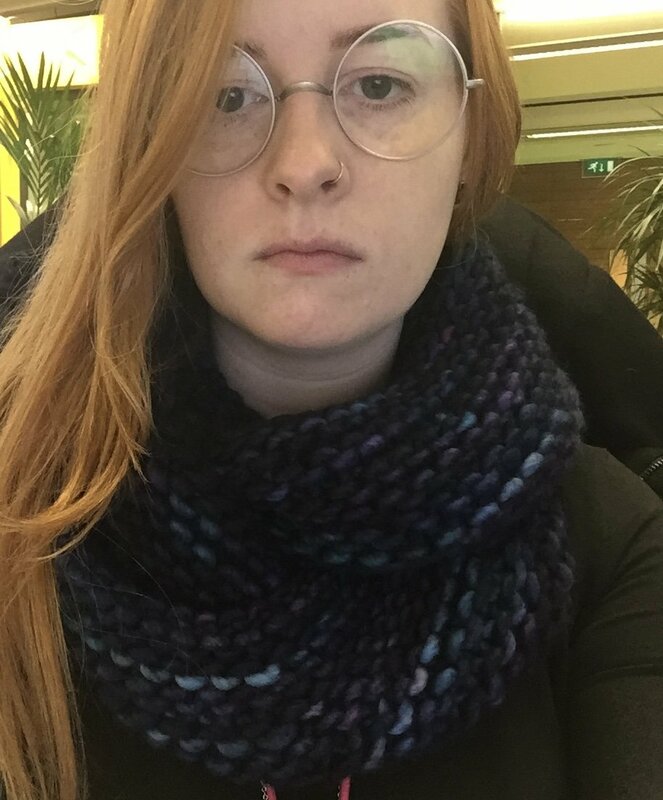 And so I was wondering after knitting and casting off the regular long scarf, is there a specific technique or way to sew the two ends together? Or in other words, (sorry if this sounds like a very newbie question ><) how exactly would I sew the two ends together? Thanks for your reply! Okay cool, I’ll try that out 🙂 Thanks for the link! 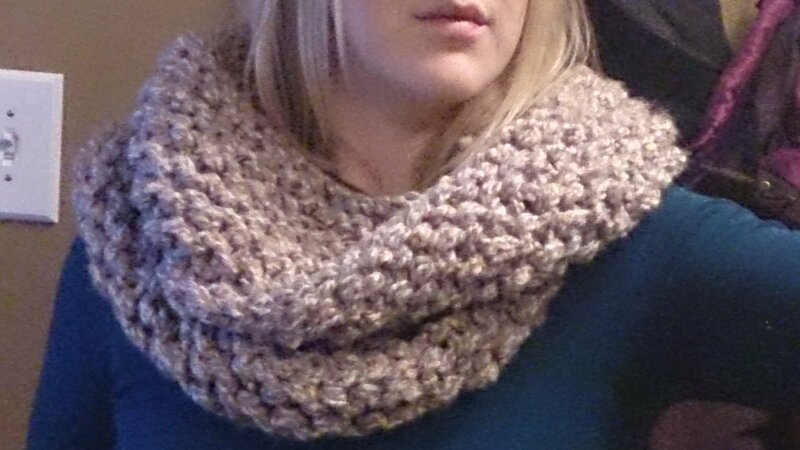 And just wanted to clarify, would I be using yarn or sewing thread to sew the two ends of the cowl together? Thanks for this video! I’m just learning to knit and this is by far the easiest video out there that explains the basics so well. So I’ve got my 7″ and just finished a knit row, not sure I’ll have enough yarn to do a purl row then cast off. Is it possible to cast off in a purl row? Hey Erika, Absolutely you cast off on a purl row! It’s the same technique as a regular knit cast off, except you purl instead of knit: purl 2 sts and pull the first stitch (the one on the far right) over your second stitch (the one you just purled); purl another stitch and repeat the process of pulling the far-right stitch over the next stitch. Voila! It looks fantastic and so cozy! Bravo!!! I love your videos. Really easy to follow. I would like to make the big hat for my six-year old daughter. How many stitches and rows would I use? Hi, Davina..is my first time here I love the way you explain step by step..my native language is Spanish and I understand very well everything explained by you..I will buy my stuff to start making the big red hat,and after that I will make a Cushy Cowl ..I think my daughter will love it. last year I was diagnosed with breast cancer and after my surgery I start making hats for the kids with cancer was my really work ..but I really like to learn more about knitting, please feel free to send me any site where I can found more about your job. Thank you and God Bless you. What are the circular needles you used for the cushy cowl? they look beautiful and comfortable i just wish i could get my hands on em! can’t see anything similar anywhere! If I remember correctly, they’re from Lantern Moon. Not a cheap needle, but really beautiful with a good weight to it. Hey Ann! Sorry for the late reply. You’re right. The gap will close as you continue knitting. When you’re done your cowl, you can tighten up that gap by weaving in that loose strand of yarn leftover from you cast on. Hope that helps! I love your video! However, I can’t seem to download the pattern. I have tried several times and it won’t completely download. Is there any way that you could email it to me? That’s odd that it won’t download completely. Usually the problems are related to viewing the PDF rather than downloading it. Either way, do email me at [email protected] and I’ll email you the pattern. Thanks! I just saw your comment. It turned out that I was able to download it in my Safari browser but not the Chrome one. Not sure why but I’m almost finished with the cowl. Great pattern! Hi Davina! Your videos are such a pleasure to watch, they make me super excited to start a knitting project. I actually just learned the knitting basics over the holidays from my bf’s mom and now want to get started on a cowl scarf on my own. I’m about to buy the round knitting needle and the flat noodle (I don’t own any at the moment). If I’m using the US17 in the round, does the flat needle also have to be the same size? Hope the question isn’t too silly, I’m a complete novice! Thanks for your help! Anyway, for this pattern you don’t need a set of flat needles. You only need a pair of circular needles to knit it up. So if you get some bulky yarn and a pair of US 17 circular needles (I love that you accidentally called them “noodles”!) you’ve got everything you need for this pattern. So, if you purchase a set of flat needles, feel free to get any size you need. Hello, thanks for the videos, I just finished my first knitting project that was made using your tutorial. I did the garter stitch cowl but I didn’t do it with circular needles. I was just wondering, mine came out a little stiff, the resulting fabric hasn’t got a drapey feeling. What did I do wrong? Did I knit too tight? This has something to do with knitting tension. It could be that your yarn is too thick for your needles or vice versa. It could also be that you’re knitting very tightly. However, how you knit shouldn’t be a huge factor unless you’ve got a death grip. My guess is that your yarn might have been very thick and your needles too thin. This is usually why fabric is tight. If you bump up your needles by one or two sizes, your fabric should loosen up a lot. Oh! Another reason could be the fibre of your yarn. Certain types of wool are more stiff than others depending on the breed of sheep (I won’t go full fiber geek on you here). Merino is very soft and drapey. Alpaca is especially drapey and will give beautiful slouch even if its tension is tight. Other types of wool like Shetland will stiffen up like a board when knit tightly. Acrylic is typically quite drapey because it’s heavy. But the main culprit is probably the knitting tension. Even the stiffest yarn will drape if the tension is loose enough (think: lace). So, my guess is that your needles were too small for the yarn that you were using. One more question: You recommend a loose bind off. Would Jenny’s stretchy bind off be too loose or is that OK to use with this cowl? Sure! You can try JSSBO (here for those of you who are interested: http://www.knitty.com/ISSUEfall09/FEATjssbo.php) if you tend to knit and cast off tightly. I was able to cast off normally without the edge being too tight. You can try using JSSBO for a dozen or so cast off stitches, look at the edge and decide if it looks okay. If so, then keep on going! If it looks too loose and splayed, then revert back to the regular cast off. How long is this scarf? I want it to wrap around the neck several times.. its hard to tell by the pictures. Also, do you have any reccomendation on how to make it in two colors? If you get gauge, the cowl will be 50″. For a two color cowl, you can cast on with one color and knit until you’re ready to switch colors. Then leave a strand of about 10″ of the first color and cut the yarn. Join the new color by wrapping the yarn around the needle, leaving a tail of 10″ and start knitting with that new color. When you’re finished, weave in the ends of the two yarn strands where you joined a new color. Hope that makes sense! Thanks for answering. Not sure what the gage is…the printing was all fuzzy when I downloaded and tried to print the pattern. I wanted to ask what length your circular needles were? I’ve bought yarn that requires 8mm needles but I know nothing about the length. Please help! Hey Georgina! A circular needle that’s between 32-40″ is a good size. The yarn and if that is the name of the color? Hey Ina, The color is indeed Pearl Ten. I just did a quick search and it shows that Fabulous Yarns has it in stock here: http://www.fabulousyarn.com/malabrigo_rasta_069pearlten.shtml When I look at the photo for the color, it looks about right! It doesn’t show the purple shading, but that could just be the lighting of the yarn. I started my cushy cowl pattern today and as I finished purling my second row, I realised there was a big float of yarns between the needles. I tried pulling my tail yarn to see if it gets fixed but I think I opened a stitch in the process. Attaching a pic here, do you think that’s what happened? What should I do to fix this? Starting over is not an issue, if you think that’s the best solution. Do let me know! Just a heads up, I am using two colour threads together on a 12mm needle set. A gap is pretty normal after the first round of circular knitting. However, you can control how big it is. To avoid a big gap, when you join your yarn in the round, give the first stitch a good tug to ensure less slack between the stitches. To totally close the gap, once you’ve finished your project, you can weave the tail from your longtail cast on through the gap to close it up neatly. Hope this helps! I finished my cowl! I’m a little bit sad that I didn’t seem to knit it loosely enough… I used Malabrigo rasta but it came out smaller than I thought. That said, I’ve had plenty of compliments on it since I’ve worn it and I love this yarn. Thanks for the tutorial! Oops that image is pretty massive sorry :S! Ah great, I’ll give it a try. And sure I’ll post it! Thanks again. Hey Sandra! Sorry to hear that! I know knitting can be tough for lefties. Can you explain what you mean by, “I was ruling and it was no longer connected”? Do you meant that the stitches weren’t connected in the round? Did they slip off the needle when you were just starting to join? A great video. You explained everything so well which made it easy to follow. You are a good instructor. Thanks. I was only able to find size 15, 36″ circular needle. I cast on the 100 stiches and they don’t even cover all the wire. Should I cast on more? A lot of the times, the cast on stitches can bunch up on the needle. You can try stretching them out so that they spread out onto your needle. Use your hand to grab hold of a bunch of the cast on stitches and gently pull them away from you so that the stitches spread. Do this across your whole cast on row and see how much you can get the cast on stitches to spread. If the stitches are still not covering the whole needle, then you can consider casting on more stitches. This will make your cowl wider though, so do keep that in mind. Hope this helps! Hi Davina! One issue I’ve run into is that the circular needles I bought are only 29 inches in length (from needle tip to needle tip) instead of the 32 inches that is stipulated in the directions. I was wondering if this might cause me problems while attempting to knit this cowl. Hey Michele, the 29″ is perfect! The yarn may bunch up a bit while on the needles, but you’ll be able to knit the cowl. I am a total newbie…….saw your utube video AND FELL IN LOVE WITH THAT COWL. Searched you out and found your web site. Great site. Thank you. that wonderful cowl. I’ll be returning time and time again. Do you have any tips on how to alter this for a 5 year old? Hey Jo! You can check out this video on “How to knit a seed stitch cowl with any yarn”: https://youtu.be/J64WrUkaU0o At the 16:06 mark, I go through how to customise the exact circumference of a cowl. 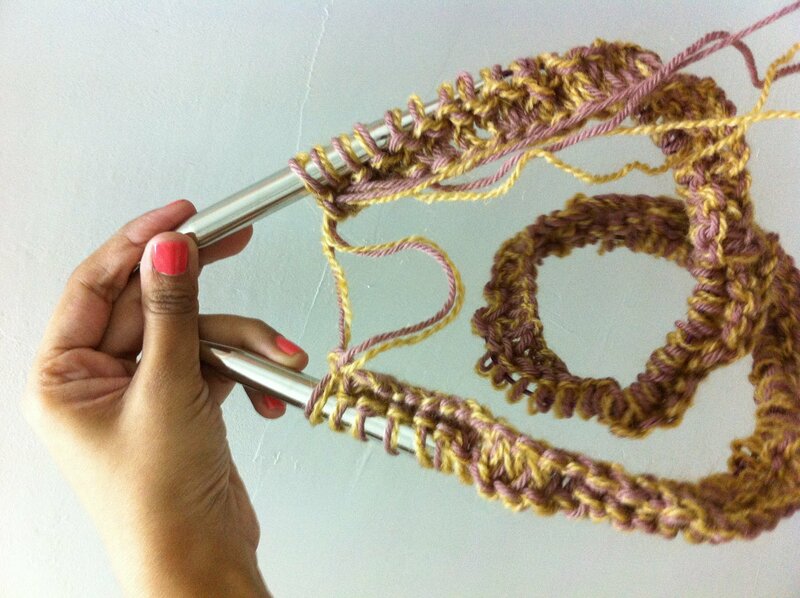 You can use this same method to customise the circumference for the cushy cowl. It involves deciding how large you’d like the cowl to be, knitting a small swatch to determine how many stitches make up an inch and then multiplying that number by the number of inches you want your cowl to be. Hope that helps! I seem to pick up a stitch every time I do a purl row! Hi! It’s been awhile since I’ve re-watched this tutorial, but I don’t remember saying that you should wrap your working yarn around the needle before moving the stitch marker over. This is called a “yarn over” and will definitely create a new stitch, which we don’t want! Since this is happening on a purl row, I think what I meant to say is to bring your yarn up front, because the next stitch is going to be a purl stitch, which requires your yarn being up front and not in the back. So, you’re not wrapping the working yarn around your needle and then purling. You’re just bringing your yarn up front in preparation for that new purl round. Does that make sense? Sorry for the confusion! I just finished the cowl and not sure where I went wrong! The scarf turned out okay but not as long (39 in.). I cast on the 100 stitches, used circular needles US 11, and super bulky yarn. I am a new knitter, and love it! 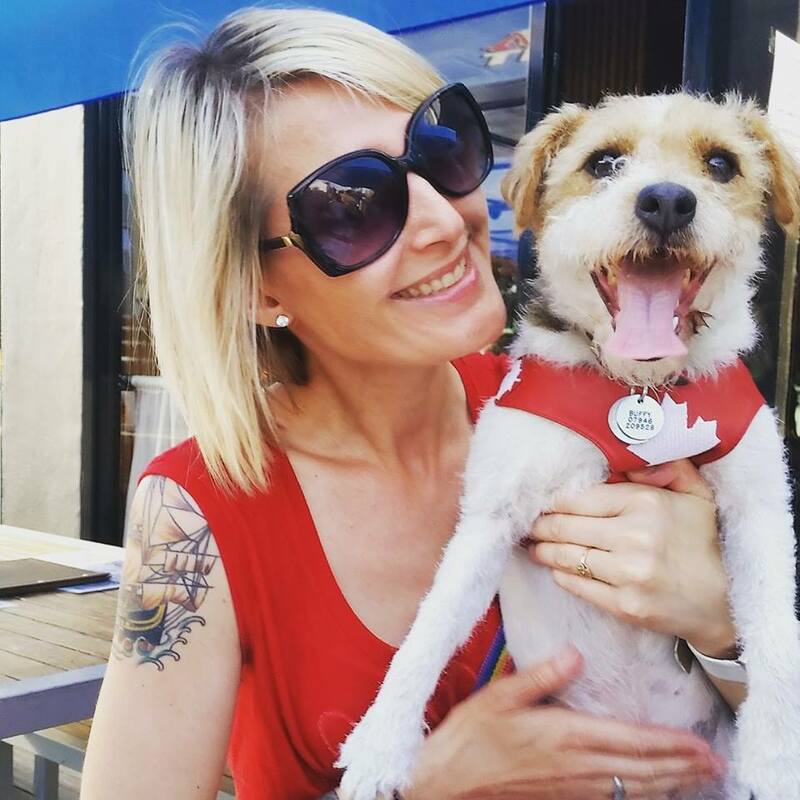 Your site has helped me sooooo much. But obviously I’m missing something. Help! Hey Cindi! Congrats on completing the cowl! To get the exact same measurements as the cowl in the pattern, you’ll need to have the same knitting gauge as what the pattern calls for. That would be 8sts=4″/10cm in garter stitch. So if you’re able to knit a square of fabric with your yarn and needles in garter stitch, and have 8 stitches measure out to 4″ or 10cm, then you’ve got the same knitting gauge as the pattern, and your cowl will come out to the same measurements. Here’s more on knitting gauge: http://sheepandstitch.com/what-is-knitting-gauge/ However, checking the knitting gauge happens *before* you start knitting. Since you’ve already finished your cowl, what you can do is block it so that it stretches out and becomes longer. Blocking entails soaking your finished cowl in lukewarm water, for about 5-10 minutes, and then pushing the water out (not wringing it, never wringing it! ), and then laying it out to dry. When your knitting is wet, you can stretch it, pull it, and basically widen or lengthen it as you see fit. Once you’ve pushed and pulled your cowl to the length you like, use sewing pins or safety pins to pin your cowl in place. Your wet knitting will dry in that shape. It’s pretty cool, and a real lifesaver if your knitting turns out a bit small. Here’s a video on blocking a sweater: https://youtu.be/7dL0wggBy7I The same principles apply to blocking a cowl. Hope that helps! Hi. can i do this with simple wooden needles? Do you mean two straight needles as opposed to the circular needles? For this pattern, you really do need a circular needle (the big long one with a flexible cord). It’ll be pretty impossible to knit the cowl on two regular straight needles. However, you could knit a similar cowl with straight needles by casting on a number of stitches (depending on your yarn weight and the width that you like) and then knitting a long scarf. Once you cast off, you can sew the two ends of your scarf together into a loop, thereby making a cowl. Hope that helps! There are some folks that are born teachers!! You are one of them!! Simplicity with clarity equals genius!! Thank you. I hope you post a how to cowl fair isle type. I want to learn how to knit that stitch. Thank you.